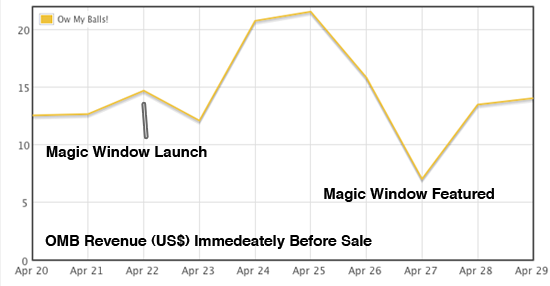 After releasing the Lite version we saw no movement in sales numbers. 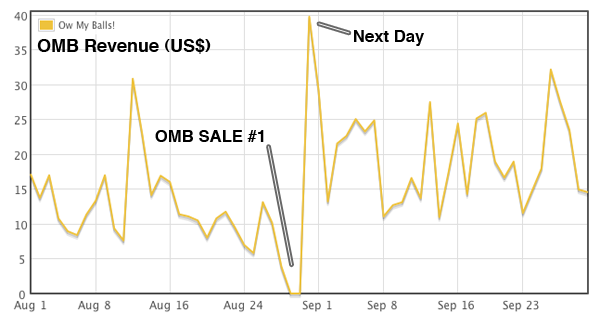 This was in part due to the fact that it was hard to make a Lite app out of the game – we had to include about 80% of the game in the lite app, which doesn’t leave much value for the upsell. 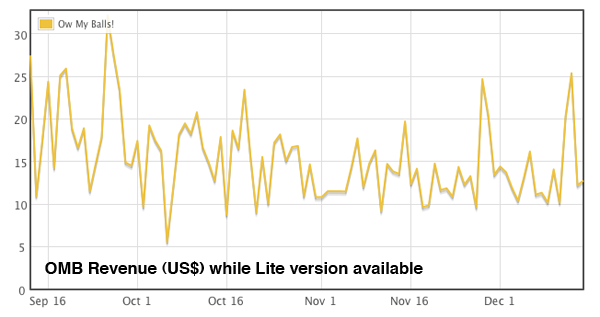 Beyond not having a good line between our lite and paid app, customers seem to be skeptical of lite apps now. 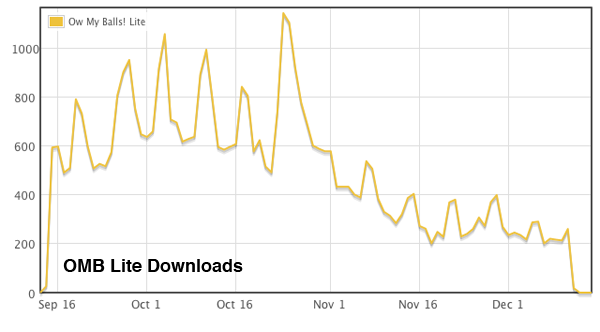 We did the lite app after we did our first sale where we saw over 8K downloads in one day. 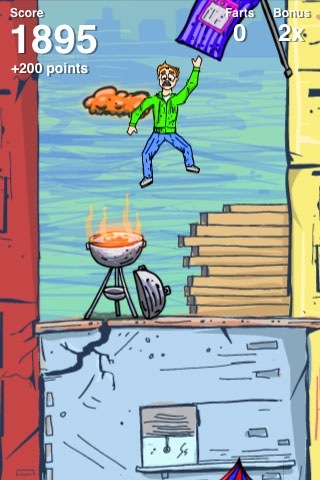 We figured damn, if the app did that well free, than the Lite version should do nearly as well. Not so. 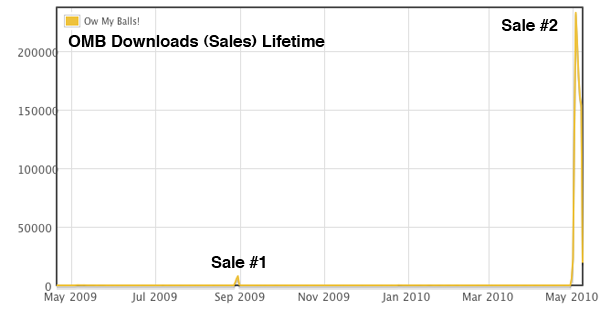 The Lite version never peaked above 1.2k downloads a day. I believe Lite apps are for the most part a solution for a problem in the store that no longer exists. Now that you can have free apps with in-app purchase, making a second Lite app just doesn’t make as much sense. The very fact that it uses the word “Lite” in the name makes people suspicious that it is highly stripped down, and no one wants to waste their time on a stripped down app. If there’s one tip I’d like to leave you with it’s this – KEEP TRYING. Most of the people who are successful in the App Game have put an extraordinary amount of effort into finding that success. 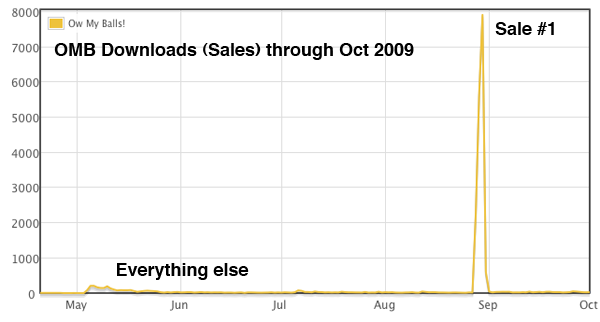 For every app that found success easily (see iShoot and Trisim) there are at least a thousand that didn’t. 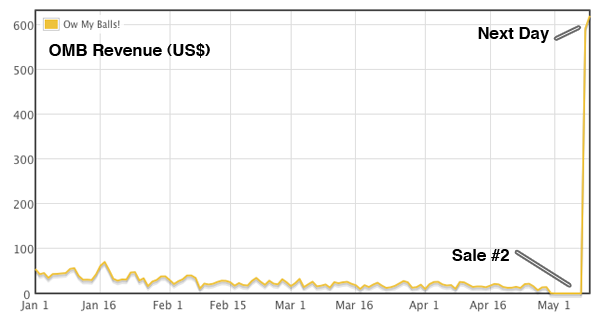 The App Store is not easy money, but it is an amazing opportunity, and one that I’m grateful to be a part of. Thank you to everyone who helped Ow My Balls! 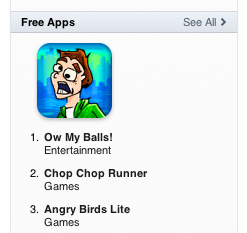 along the way, especially KRAPPS, The Appera, Eli Hodapp at TouchArcade, and TUAW. And thanks to those who never gave up faith that this could one day make it big.